This is part two of my Big Ten expansion series in which I examine what schools would be best for Jim Delany to focus on as he looks to expand the footprint of the conference. We are using several criteria to determine what schools make the best acquisition targets. First we've narrowed our list of potential schools geographically based on Ohio State President's comments stating that they are focused on schools in the southeast and midwest. Now that we have already decided on the Eastern expansion it's time to focus on what midwestern based schools are most appealing in terms of Academic standing, TV Market, and contiguous location based on current B1G footprint. We already examined the biggest TV markets so lets just look at how big the markets are for each of the above schools. Oh, Texas? That seems like it would be a pretty big deal. 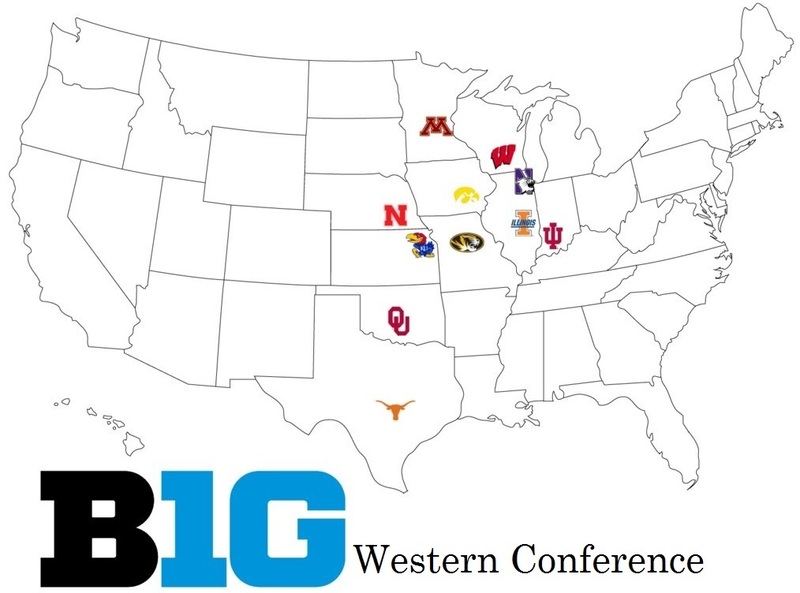 It would be a huge deal and if any other conference could even think of adding Texas it would be the Big Ten. The Big 12 already seems to be on somewhat shaky ground having lost Colorado, Nebraska, Texas A&M, and Missouri in the past few years. Not to mention the Big Ten openly wondering about the potential to add Texas two years ago when Nebraska joined. Let's just go crazy for a minute and assume that Florida, UNC, Georgia Tech, and UVA joined out east. If Texas doubts the long term viability of the Big 12 at all, they have to feel pretty good about the Big Ten given that stable of elite schools. If they should pull the trigger and jump into the Big Ten I think the rest of the dominoes fall their way as well. Looking at the above list of schools, while trying to avoid duplicating TV markets and staying contiguous the path to connect Texas to the existing footprint becomes pretty clear. Nebraska shares borders with Kansas and Missouri so either of those would do. However, we run into an issue where there are no schools connecting states between Texas and those two. Here is where we make another big leap to add Oklahoma. They would be the only non-AAU school the Big Ten would look at. Oklahoma has very good athletics programs and are currently ranked #101 undergrad institution in the US by US News and World Report. Given their long standing rivalry with Texas and more than adequate athletics programs I think they would be the final school to get tapped. That is how we get to the situation where the Big Ten adds Texas, Oklahoma, Kansas, and Missouri. That is another outstanding haul for Commissioner Delany. The diagram above illustrates what the Big Ten's new Western Conference will look like. Next up in this series I'll evaluate the entire 22 school B1G with two full divisions of 11 institutions.